VIP has been in the business of running music related fairs for over 35 years – during this time more product has been bought, sold and displayed within VIP’s Record Fairs than any other music selling medium in the world. Whether you run a shop, Mail Order Company or simply looking to sell your music collection, VIP’s shows give you the best route to success. VIP runs an established circuit of shows in the UK – from Glasgow down to London and Norwich over to Wolverhampton with a major presence in London, the Midlands and Northern England. One of the many reasons for the company’s development has been the service provided to its sellers. From our head office in Leicester, VIP is always available to handle any seller queries, constantly updating you on new developments and always endeavoring to make your participation a hassle free and profitable one. You can sell anything to do with music at a VIP Record Fair– Vinyl Records, CDs, DVDs, memorabilia, books, videos, cassette tapes, posters, T-shirts, programmes, badges, photographs, presentation discs, magazines, artwork, promos, tour jackets, accessories, old record players – the world is your oyster with VIP. Any era of popular music is welcome at VIP. From Rock, Pop, Indie, Metal, Grunge, Punk and Soul music, to Rock and Roll, R&B, Doo Wop, Jazz etc. 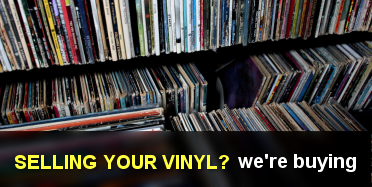 Even classical vinyl is appearing in the seller’s boxes! 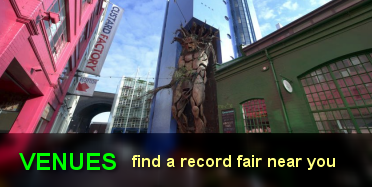 At some venues we have a 5 for 3 deal on tables this gives you the opportunity to take a large collection to a VIP Record Fair and only pay 60% of the table rate. Send us an email with your name & full postal address (including postcode) and let us know the fair you wish to sell at. Alternatively telephone our office (telephone 0116 275 2815). If you would like to reserve a table at any of our events, please detail the venue and dates. Table pricing details can be found on the relevant venue pages. Try to plan well in advance and you will avoid disappointment. Payment for your table/s must be made before the event. We accept bank transfers and cheques should be made out to ‘VIP EVENTS’ and forwarded to our head office with a covering letter. A receipt will be sent if requested. 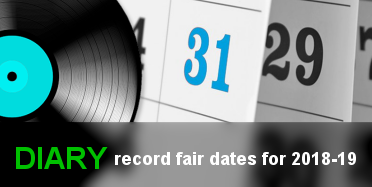 At the Record Fair, VIP will provide your table, chairs, carrier bags etc. VIP staff will be on hand to help you locate your table quickly – a table plan is prepared in advance, before anyone enters the venue. The staff will also advise you on parking, catering facilities etc. All you will need to do is unload your own stock onto your table. Try to pack a trolley into your vehicle to make the unloading easier. 1. Before the fair opens to the public, have a look at other stalls to see how things are laid out, displayed and priced. 3. Take two dark sheets to the event. One can be used to cover the table and it’s legs, giving a more professional look. The other can be used to cover the stock if you need to leave your table for any reason. 4. Public admission to a fair usually finishes at 3.30pm (see venues information) We ask sellers to wait until this time before packing away. 5. VIP staff will visit each table during the afternoon and give everyone the chance to book for future events. You may book as many tables and events as you wish, as long as payment is made for the next fair that you wish to attend. 6. Try to communicate with VIP’s customers. The dealer that reads his newspaper all day sells fewer products than the one that tries to help the customer! 1. Major ads in the Specialist Trade and Music press. 2. Local marketing including press, leaflets, posters etc. 3. Frequent emails to the full VIP email database – probably the biggest in the world. 4. Local signage, leafleting and banners on the day of each VIP Record Fair. 5. Leaflet inserts into mail order packages. VIP Makes it easy! Load everything up you want to sell, get to the VIP Record Fair, we show you to your table, set everything out on your table and sell! We get the right buyers. We have been dedicated to this trade for more than 3 decades! All the major players visit our events and our top notch marketing produces new buyers every week. Low cost – You just pay for table. No listing fees, advertising fees, rates, electricity, staffing, alarms etc. The only cost is your table rent. You are under cover. With market stalls there is a risk with the weather – from the wind and rain to product damaging sunshine. 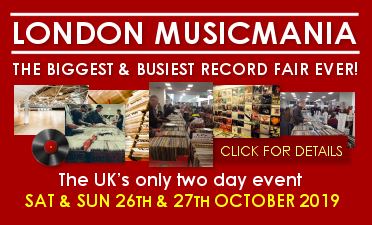 VIP’s Record Fairs are all inside high profile venues. No Internet and postage hassles. You have to work very hard in Internet trading. With us there is NO arduous listing, printing and packing, standing in the queue at the post office, problem payments, lost packages, unfounded customer complaints – you get the picture! Standing at a VIP Record Fair eliminates these issues. Meet the customer, have a chat, do the deal – job done! Face to face contact. There is nothing like talking directly with a customer at a VIP Record Fair. This is the best way to develop BIGGER sales and gain more knowledge yourself. AND THE BEAT GOES ON. 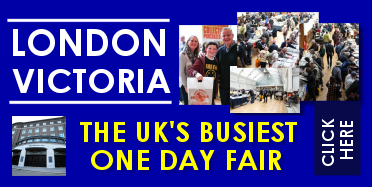 As well as taking good money, you’ll find that a fair is the best way of promoting your business – some sellers do as much trade from follow up business as they do at the fair itself. 1. Local Advertising. An ad in your local newspaper or a postcard in newsagents and post offices often attracts people with unwanted collections. 2. Car Boot Sales. These are great places to pick up stock for pennies. We regularly talk with dealers who find ‘gems’ at these events. 3. Check Out the fairs. A lot of ‘in house’ trading goes on at the VIP shows A soul dealer may pick up some ‘indie’ product and sell them in his cheap box. 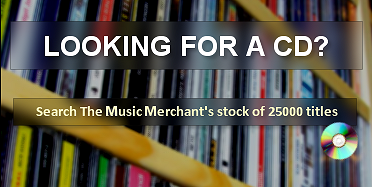 A CD dealer may pick up some old concert programmes and pass them on to a specialist. VIP encourages collectors, DJs etc to sell their unwanted items at a VIP event when it is in town – look out for people carrying boxes of goodies! 4. Wholesalers. Check out copies of the music press, Record Collector often has some good wholesaler contacts. 5. Auctions. At many of the auctions you will find music-related items among the lots. Sotherbys, Christies and Phillips cover the top end of the market. Local and charity auctions often unearth some major ‘finds’. 6. The Internet. Ebay, Gumtree and countless others have job lot/wholesale sections – the source of many great finds. Stock is not allowed under tables or on the floor – please book more tables if you need more space. · No tables can be packed away until the official closing time of any fair. · No promotional work allowed without the advance permission of the organiser. · Wall tables are allocated on a first come, first served basis. Please check with VIP staff before fixing anything to the walls of a venue. · Your stock is not insured whilst in any VIP venue. · The sale of bootlegs and counterfeits is illegal and VIP cannot be held liable for the actions of the relevant monitoring bodies that do monitor these events. · Large boards and extensions are not allowed. Please book extra tables if extra space is required. · VIP reserves the right to decline the rental of tables at any time, in which case no claim by the exhibitor for damages or breach of contract shall be valid. · Tables must not be sub let to other traders/ exhibitors. · Stand rentals are an exempt supply for the purposes of V.A.T and therefore you cannot claim any input tax relief in this respect.